The L-shaped seating is the undoubted star part of this eye-catching outdoor living area! What tops the wooden plank base is soft foamy seats and cushions in coordinating prints. Install a small coffee table that matches the texture of the seats, adding a few final touches of decor with small vases in a variety of shapes, sizes and colors. 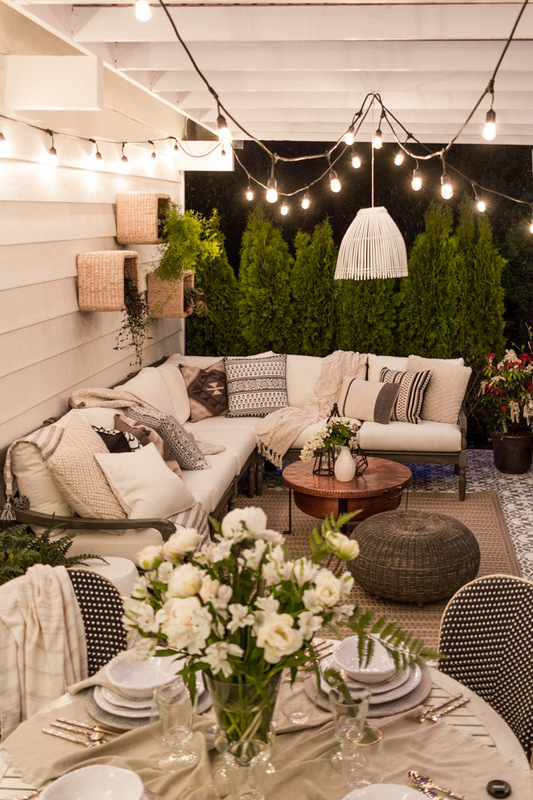 Glowing string lights installed on the fence not only add so much more light, but also enlivens this outdoor living space. And the much needed touch of fresh greens is brought by a whole spectrum of planters and pots arranged along the fence. The bench in this inspiration by Rachel Bernhardt is a work of wooden planks, accompanied by a cozy blanket. Everything, ranging from that round dining table, the gorgeous bistro chairs or the sectional seating, this banquet-style patio is no less than a complete work of art that comes loaded with great deal of comfort. Lots of cushions are thrown on the seating, allowing lots of textures to take over the scene. Of course, flowers, pots and greenery make it all the way more awesome. As the title quite clearly suggests that the most special element of this living area is the floor tiled with geometric floor stencils. The thick bushes hanging from the stylish ceiling keep the whole space fresh and fragrant, while the hanging chair couples up comfort with fun. An L-shaped sofa comes into play yet again to accommodate friends and family. Why wouldn’t spending hours and hours of thoughtful, relaxed and luxurious evenings become a daily ritual when you have got such an amazing outdoor living space brightening up your home. The neutral color scheme with a creative use of hues of grey keeps everything pleasantly subtle, while those lanterns resting on the coffee table add the perfect glow. Pint-sized stools, a gorgeous wooden dining table, benches and chairs – this super stylish outdoor living section is more than perfect to plan a great celebration with the whole family. The rustic-looking rug beneath the dining benches takes the table to a new level with its unique design, while a few bright lemon-hued cushions work as the pop of color. Each of the accents and furnishing of this well-designed patio go hand in hand with its point of focus – the 3 seater sofa with 2 chairs, and two pretty ottomans. The wooden coffee table with a weathered look couldn’t look any better with those pretty planters and two different-sized lanterns. Ample of cushions are equal to utmost comfort! Simplicity at its best is defined with the Praiano Outdoor Collection that includes a gorgeous bench and its coordinating accents – an outdoor chair, a lovely storage coffee table, and a storage side table. Succulents planted in different pots make it oh so adorable, while that lacey table runner in creamy white gets the touch of elegance to the whole space. The wonderful floor showcased in this inspiration by Old Brand New is the unbelievable end results of clever stencil printing and painting that would otherwise cost thousands of dollars if achieved in tiles. The low height bench with its super soft seats and colorful patterned cushions is enough to charm the space, but the planters only make it even more amazing. The crafters have selected a combination of earthy and metallic colors as well as textures to make the finished outdoor living space look beautifully natural with a little industrial touch. The mini fireplace goes for adding warmth to the evenings, wired seats in a unique shape allow for a comfy seating, the full-length shelves are other special features.